Midfielder Jack Bridge admits the time for the Cobblers players to stop talking a good game, and to start producing out on the pitch. Town entertain bottom-of-the-table Notts County at the PTS Academy Stadium on Saturday, in desperate need of a win to pull away from the Sky Bet League Two relegation zone. Despite some encouraging performances, the Cobblers are still without a win on home soil this season, and some fans are getting ever more frustrated. Bridge understands their anxiety and shares it, but he accepts the players can’t keep saying things will get better and then not follow up that pledge when it matters. And he says it is down to the team to get the fans excited, and to give them something to really get behind. “There has been a lot of disappointment, but there have been positives from the games as well,” said the former Southend United midfielder. “From box to box we have been playing well, but we know we have to improve at both ends of the pitch, and as of this weekend we have to start on the front foot again. “We know the fans will get behind us, but we have to stop talking about it and actually do it. “We need to get ourselves in front and then go on and win the game. “It has been frustrating, and we do understand the frustration from the fans’ point of view. “But it is all well and good for us to keep saying that, we have to go and do it on a match day. County arrive in Northampton on a terrible run of form, having claimed just two points from eight league games this season. Last weekend’s 3-3 draw with Stevenage stopped a run of six straight league defeats, and eight losses in all competitions. Harry Kewell has taken over from the sacked Kevin Nolan, with the Magpies’ porous defence their major issue. 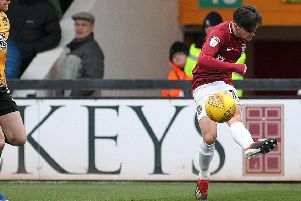 County have let in at least three goals in each of their past seven league games, and it appears to be a great chance for a Cobblers team that has been struggling to score goals despite creating plenty of chances, to fill their boots. “We know what we have to do,” said Bridge. “Defensively, when the ball comes into the box we have to put our bodies on the line and do what we have to do to keep the ball out of the net, and that’s not just the defenders, that’s everybody on the team. So what has been the reason for the lack of goals from a Cobblers team that has created more chances than anybody else in league two? “It is about having that tiny bit of composure at the right times, and also getting that little bit of luck,” said Bridge. “When the ball goes into the box, sometimes you see it when teams play against us that the ball just falls to one of their players, and we need that ball to fall to one of us for an easy tap in.